If you are wondering what your new PSPgo will look like on the inside, save yourself some trouble and watch the guys at iFixIt rip their PSPgo apart. 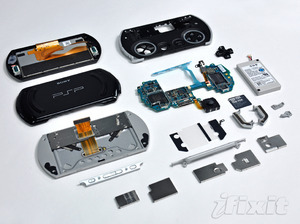 After ripping the PSP piece by piece, the team discovers some interesting components used in the new PSP. The game CPU and Wi-Fi chip from the old PSP is being used, which means no major speed boosts and still no 802.11 g/n support.